There are several names for the March Full moon, but the one I’m loving this year is the Full Sap Moon. If you grew up in northeastern North America like I did, you probably took at least one school trip to a sugar bush to see the tapping of the maple trees. There was still snow on the ground, the earth hadn’t quite woken from its winter sleep, and yet there — flowing through the maples in the form of sap to be turned into syrup — was the promise of a delicious spring. 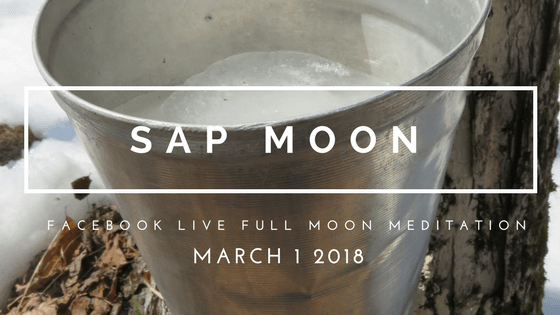 On our next Full Moon Live Cast we’re going to celebrate the springtime renewal of the Full Sap Moon. If you’re trying to conceive, sap’s metaphors for fertility are abundant. Sap is a fluid, just like pretty much everything involved in making a baby, circulating through the tree and available to tap into for the creation of something beautiful. And if you’re not trying to conceive but you’ve got other dreams you yearn to manifest, think of the sap as the blood carrying healing and wellness through your veins — or the ideas, desires, and vision invigorating your heart and spirit. And remember this: sap flows just at the point when we’re all sick of winter. When it can be easy to lose hope that the earth will ever be anything but cold and dormant. Meditate on what is thawing within you — what energy or feeling place do you want to give way to flow again through your veins? Try to make it live if you can. But don’t worry — if you’re not able to attend live, we’ll send you the recording. I can’t wait to come together virtually on the Full Sap Moon for a beautiful start to spring!